Trump will never become president. * The GOP elites know it. The DNC knows it. Hillary Clinton’s campaign knows it. The implications of this are, well, Yuge, for the Democratic Party’s primary race. The Times article makes it clear that Trump is not a viable general election candidate, which is evident in the panic among the GOP elites, as they desperately try to find a way to derail him. But they face the old rock and a hard place dilemma. If Trump is their candidate, they lose big time. If they shut Trump out, he walks, many of his followers walk, and he runs as an independent. Total disaster! Let’s be clear, either Bernie or Hillary will beat Trump, although Bernie is more likely to do so with a larger majority given Hillary’s long-standing and high unfavorables. (He is also more likely to beat the other GOP candidates according to recent polls.) So let’s stop worrying, living in fear, about a Trump victory in November. If we stop worrying about a Trump victory, then the “Hillary is more electable argument” is wasting our time. It’s a non-issue. Trump is so weak that by the time we get to the election probably anyone with a pulse would beat him. Of course Hillary’s campaign will continue to try to use electability as a major rallying cry, but it’s bogus all the way down. And of course Hillary’s camp knows it. Just look at how gleeful they have been about running against Trump. 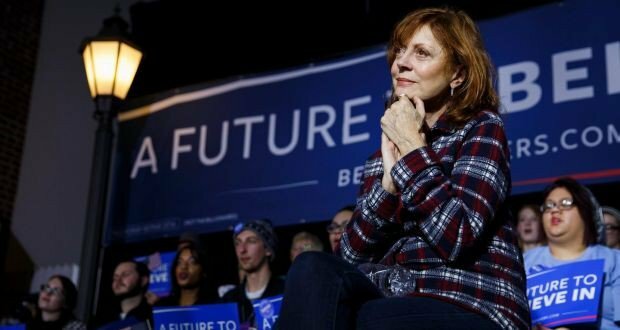 If we stop worrying about a Trump victory, then it is perfectly reasonable for a Bernie supporter, such as Susan Sarandon, to resist saying that she will support Hillary IF she gets the nomination, especially during the primary. This is different from voting for Trump, which Sarandon never said she would do. The reality is that if you live in a deep blue or red state, where most Americans live, your vote for Hillary won’t make any difference in terms of wining an election against Trump, but not voting for Hillary may make a difference. It sends a message to the Democratic Establishment: you need to earn our votes, not take them for granted. Don’t assume that we will vote for the Establishment candidate. If we stop worrying about a Trump victory, then people can consider more dispassionately the consequences of a vote for Hillary. Politicians typically look for short term results, winning the current election, like companies on Wall Street seeking to make a killing in the current market. But what we need is long-term thinking. This election is not just about the next four or eight years. It’s about the future of the country, especially because the Democratic and Republican Establishments are now feeding at the same trough. If we do not get a handle on the money and wealth that are dominating this country, we are looking at a full-blown plutocracy/oligarchy in the next couple of decades. This is not hyperbole. The vast majority of Americans already have little or no influence on public policy, but wealthier people do. Those inside the Democratic Establishment—supported by the Main Stream Media, which takes the current two party system for granted—try to wish away challenges to their authority or cynically ignore them. The Sanders campaign is a threat to business as usual, to the Democratic Party—a party whose leaders continue to support Clinton’s “centrist” politics, and who are tethered to the donor class. We need a new New Deal. Not the Same Old Deal.